Derry City will host Limerick tonight in the SSE Airtricity Premier Division. This game will mark the re-opening of the Brandywell after a gap of 14 months and the completion of Phase 1 of the redevelopment of the stadium. Given the changes to the stadium and the significant interest in this game, we have collated a list of the frequently asked questions in relation to this fixture. We are expecting a large crowd and many fans who are making their first visit to the ground, or returning after an absence. If you are a first time visitor or coming back after a while away, you are especially welcome. For everyone else, who followed us to Maginn last year, it is great to welcome you home. We strongly encourage supporters to arrive in time and to listen to the instructions and advice of the stewards. On the opening night there will likely be delays and confusion as the teething issues of any large event will show. We ask you to be patient and remember that we are all here for the same reason, to watch Kenny Shiels and his side take on Dundalk. If you have ordered a season ticket, these are available for collection in the club unit at Rathmor. The unit will be open 12-6 today for those that need to collect season tickets/paper tickets. If you have ordered a season ticket in recent days, this may not yet be available however you will be issued with paper tickets for the game and will be notified when your season ticket card is available for collection. If you haven’t got a season ticket yet and would like to purchase one for the 2018 season then these can be purchased from the Rathmor Centre unit. Are tickets required for the game? There is very high demand for tickets expected for this game and it is necessary to purchase a ticket in advance for this fixture. Tickets are available in all outlets and also available online. Please visit the “tickets” section of the club website for further details. It will be possible to purchase tickets on the night, as an outlet will operate near to the Long Tower Youth Club. However supporters are strongly urged to purchase tickets in advance to avoid delays. U-12 are admitted free, how will this be managed? U-12s are admitted free to the game, but need to be accompanied by a paying adult. It is not necessary to obtain a ticket for U-12, however their access will be recorded by a steward by means of scanning a barcode. In future a separate access for those bringing children to the game will be provided. Please note, access for U-12s without a ticket does not guarantee access to a specific seat. If you wish to sit with U-12s it will be necessary to occupy areas of unreserved seating(likely to be blocks C,D,K,L,M) of the Southend Stand. Please note that U-12s will not be granted access to the Mark Farren Stand without a valid ticket. 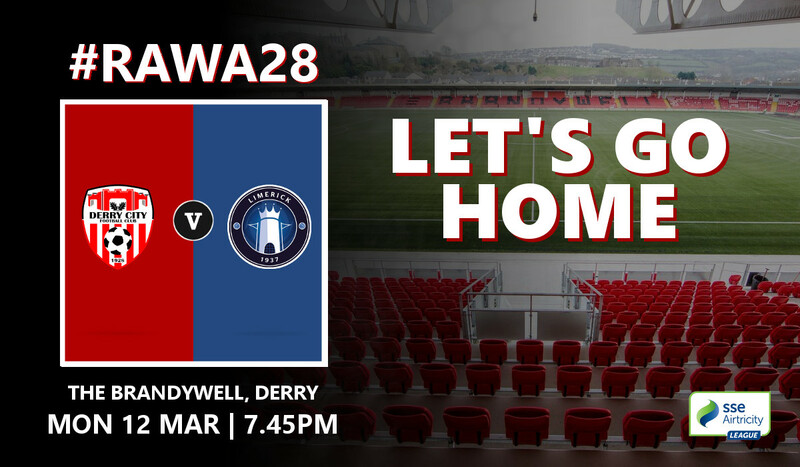 Terrace tickets are not available for this fixture, or any future fixtures in the Brandywell. Are there facilities for the disabled/wheelchair users? Disabled facilities are available in both stands, however the majority of spaces for disabled users in the Mark Farren Stand have been reserved for season ticket holders. If you require disabled seats additional seating is available in the Southend Stand. No access will be granted to those who have not received written confirmation from the club on their request to attend the game. Members of the press should have received communication from the club PRO on access arrangements for the game. If not, accreditation has now closed and no further requests will be accepted. Is there parking available at the ground? Access to the club car park is strictly restricted to those who have applied to the club in advance and those required disabled drop off and collection access. On street parking will be available in the Brandywell area but please park responsibility, bearing in mind to keep access clear for local residents and also area users. How do I get into the ground? Access to the ground will be by scanned ticket only. Please present your season ticket/match ticket according to the instructions of the stewards in order to gain access. Please go to the access point which is appropriate for the stand for which you hold a ticket. Supporters holding tickets for the Mark Farren Stand should access via the Lone Moor Road. Supporters holding tickets for the Southend Stand should access via the Brandywell Road. How do I get to my seat? If you are holding a season ticket for a specific seat; the Block, Row and Seat Number will be displayed on your seat. Please make your way to your seat or ask the nearest steward to direct you. Seats reserved for season ticket holders should be marked with a sign indicating as such. If you purchased a match ticket, please note that these are unreserved seating. The majority of the Mark Farren Stand are held by season ticket holders and the centre blocks of the Southend Stand are held by Season Ticket Holders. If you occupy a seat which is reserved by a Season Ticket Holder you will be asked to vacate this seat by the ticket holder and/or stewards. To avoid any issues, we recommend that supporters holding match ticket occupy seats to the left and right of the centre five blocks of the Southend Stand. I’m an away Fan, where do I sit? Away fans will be situated in Block A and Block B of the Southend Stand. Please enter from the Brandywell Road entry and make your way to this area of the stand. Away supporters are strongly encouraged to purchase tickets online ahead of travel to the ground. Is there a family area? There is no dedicated family area inside the ground. Depending on the age of the children that you may be bringing, you may wish to sit near Blocks J & K of the Southend Stand. These are where the most vocal Derry fans normally congregate and the children attending may enjoy the energy and colour in this area of the ground. Please note that there are no baby changing facilities in the ground. If you have a question or need help with any aspect please seek assistance from the nearest steward. These will be clearly marked in high-vis jackets. If they are not able to resolve your query then they should be able to direct you to people who will. Is there somewhere I can buy merchandise in the ground? Unfortunately due to the timescales on the project, the retail unit in the Brandywell will not be open on the opening night. Supporters can purchase items all this week from the unit in Rathmor, which opens 12-6 Wednesday to Friday and then 10-2 on Saturdays. We are hoping to have the retail unit complete and in action from the next home game onwards. Programmes, half time draw tickets will be available from sellers throughout the ground. Is there somewhere to buy food during the game? Absolutely. However stewards may ask you to remove bottle tops and other items in order to comply with stadium regulations. Alcohol is banned in the ground and supporters attempting to bring alcohol into the ground may have this seized and/or be prevented for accessing the stadium. Are there toilets in the ground? Yes, toilets are available near both the Southend Stand and Mark Farren Stand. After the game, please leave the stadium in an orderly manner. The Brandywell is a residential area and we would ask supporters to be mindful of local residents when leaving the ground. We are looking forward to welcome City fans old and new back on Friday night. We hope that this guide will answer many of the questions. Our advice is simple! Get your tickets in advance, come early and work with the stewards and your fellow supporters to ensure that everyone enjoys the night. If you have feedback, we would love to hear it. Please contact us via one of the channels on our website.